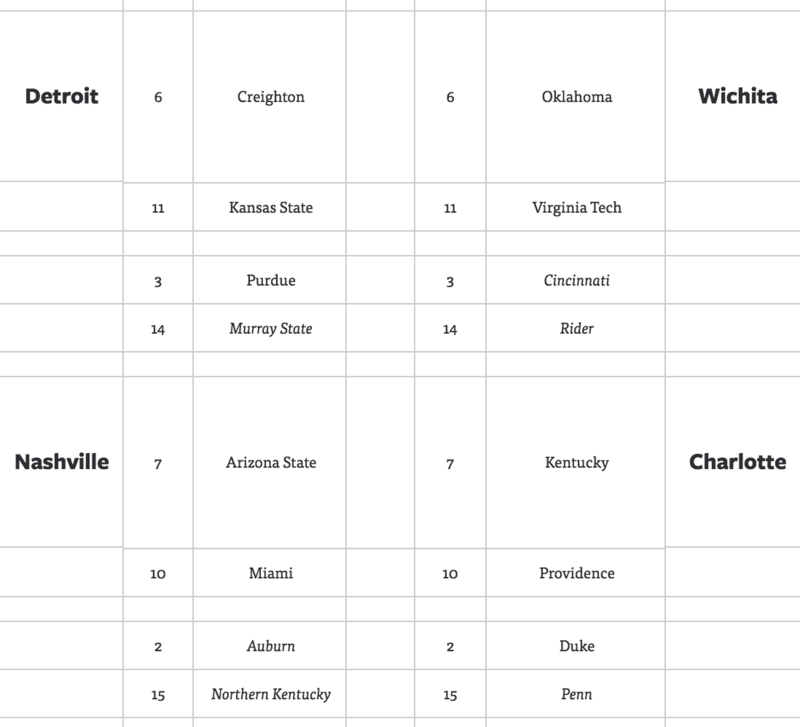 Our latest bracket projections with conference tournament time nearing. Top 10 teams keep on losing, the Big 12 is out of control, and the bubble is getting more competitive. If the three weeks leading up to the postseason continue like this, they will be absolutely bonkers, which is exactly how college basketball should be in February and March. As we creep along toward conference tournament season, here’s how the bracket is shaping up. First, some reminders. 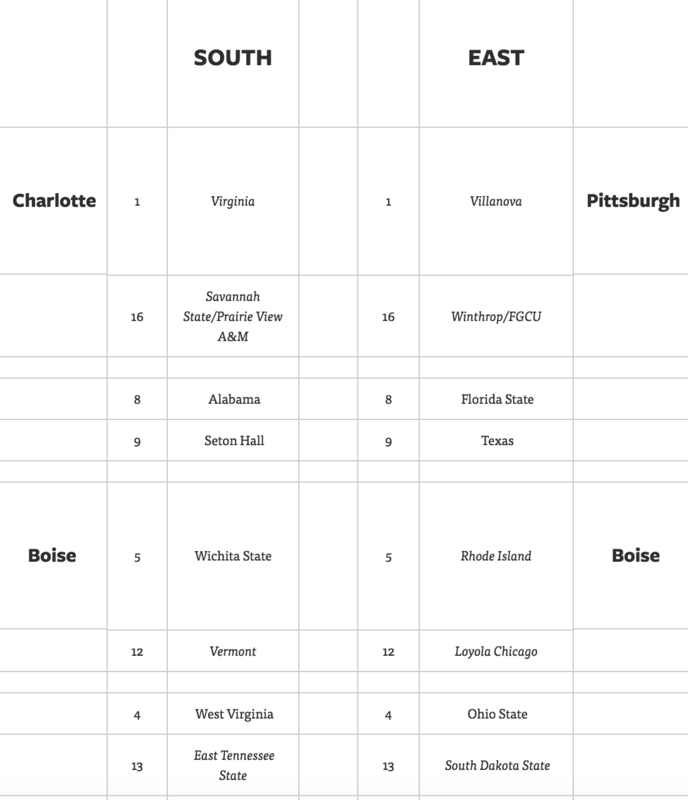 The bracket holds 32 automatic bids for conference champions (noted with italics), and the remaining 36 are at-large selections. Teams are evaluated by how they have performed to this point in the season without projecting how they will perform the rest of the year. 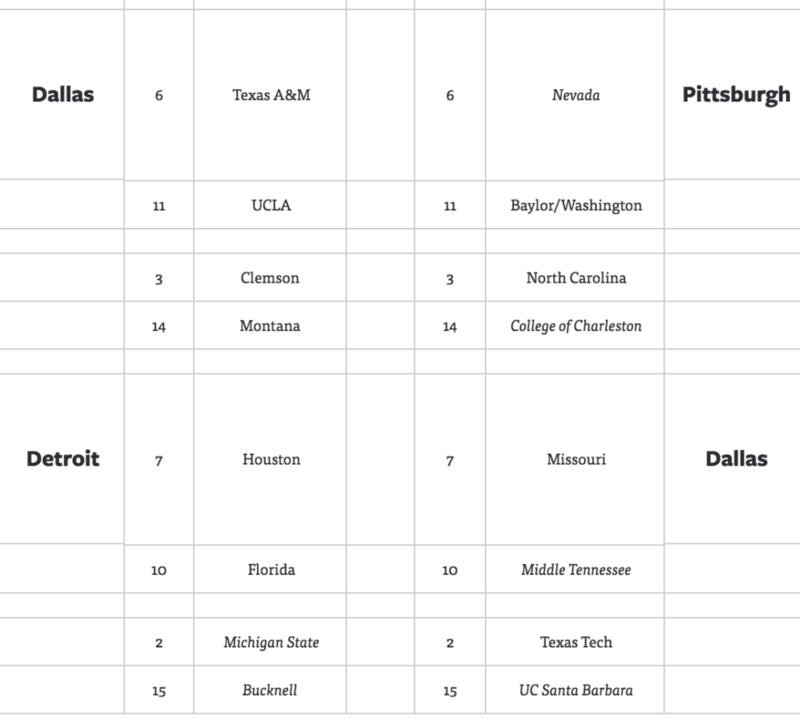 Conference champions have been selected using KenPom projections. ** The bubble got much, much tighter last week. Baylor continued its resurgence, Saint Bonaventure got a much-needed win over Rhode Island, Marquette won at Creighton, and Syracuse beat Miami (Florida) for its first road win against a team in the at-large field. Even Louisville (fifth team out) and Boise State (sixth team out) are only one big win away from returning to the picture. Unfortunately, that’s likely a moot point for Boise State. The Broncos’ only remaining chance for a marquee win would be if they face in the Mountain West tournament, and that matchup would almost definitely occur in the championship game for the conference’s auto bid. ** I’ve been skeptical of Michigan State’s No. 1 seed chances, but the Spartans (No. 2 seed, West) have been eking out a bunch of close games recently (one of which required the biggest comeback of the decade) while the elite competition struggles. Here’s the big problem that remains: Michigan State is 2-3 against teams in the field. Granted, they’d probably be 3-3 against such teams if Notre Dame star Bonzie Colson hadn’t gotten hurt. 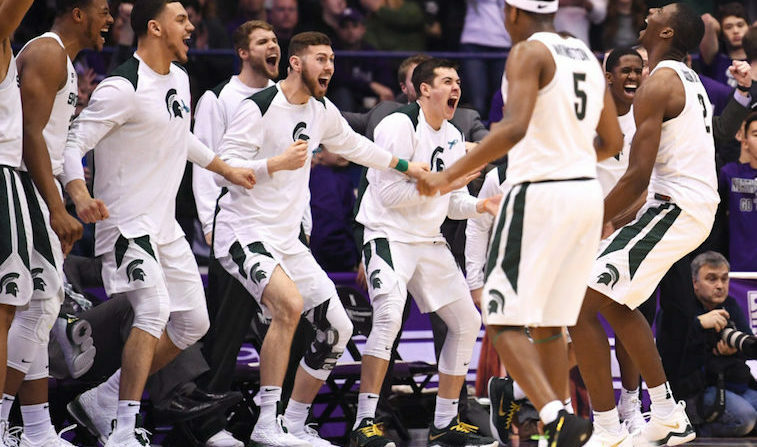 The Spartans will need to do more than just beat Illinois and Wisconsin this week to finish the regular season 28-3. They’ll need at least one win over Purdue, Ohio State or Michigan in the Big Ten Tournament to reach the top line. ** Not long ago, Wichita State (No. 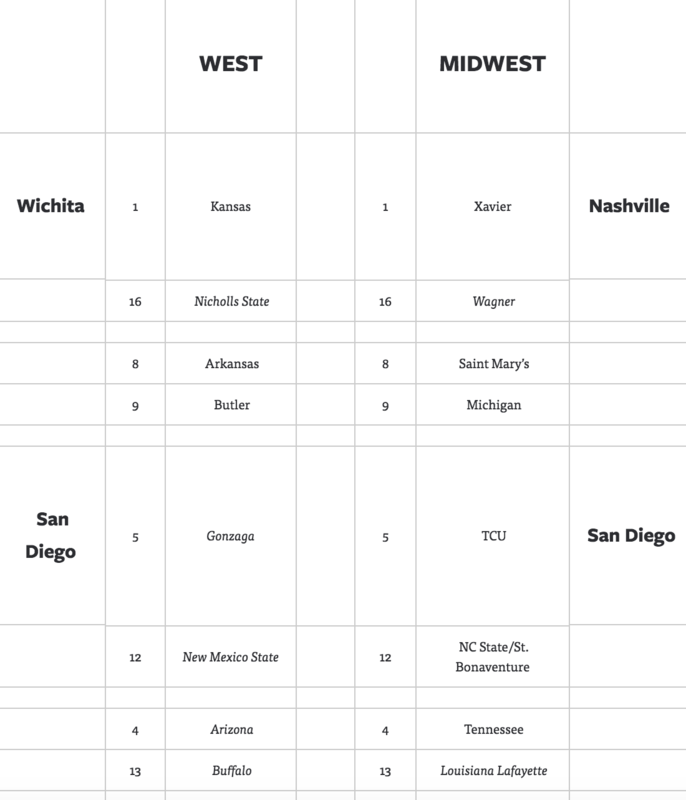 5 seed, South) comically found itself in the familiar position of a projected seed far worse than its KenPom ranking would suggest, despite the Shockers’ move to a stronger league this season. But the Shockers had a big-time week with a win at Cincinnati, and this is exactly why Wichita State moved to the American. If the Shockers were still in the Valley, the best opportunity they’d possibly get in February would be a road game against Loyola. While the Ramblers are a solid mid-major this season, they’re still not even in the at-large field. Instead, Gregg Marshall’s club got a marquee Quadrant 1 win (in addition to Quadrant 2 win earlier in the week vs. Temple), and they’ve gone from a No. 8 seed to a No. 5 still with another opportunity against Cincinnati at home in two weeks. **You don’t usually see KenPom Top 25 teams miss the NCAA Tournament, but that could be the case with Penn State (eighth team out) this year. The Nittany Lions narrowly missed out on a golden opportunity this week with a 76-73 loss at Purdue, but at least they got the season sweep over Ohio State. Penn State can still get two more Quadrant 1 wins with games against Michigan and Nebraska to finish the season, but it’ll still need at least one win in the Big Ten Tournament to be in the mix on Selection Sunday. **Can the Big East get two No. 1 seeds? Villanova (No. 1 seed, East) is still in great shape thanks to Saturday’s win at Xavier (1 seed, Midwest). But Xavier, despite ranking No. 3 in RPI, will likely need to win the Big East Tournament to stay on the top line. The Musketeers have some solid victories — home vs. Cincinnati, at Seton Hall, at Creighton — but they could use a statement win away from home against a top 10 team, i.e. beating Villanova at Madison Square Garden three Saturdays from now. The NHL playoffs are an annual dose of insanity. There are a lot of balls in the air heading into the NFL Draft tonight. These guys couldn't live up to the hype.